Each Custom invitation is unique and requires a personal quote after a consultation. Once you have downloaded and filled in this form, please send it to me by email or contact me by phone (+97155 314 9444) and I will send you pricing options. 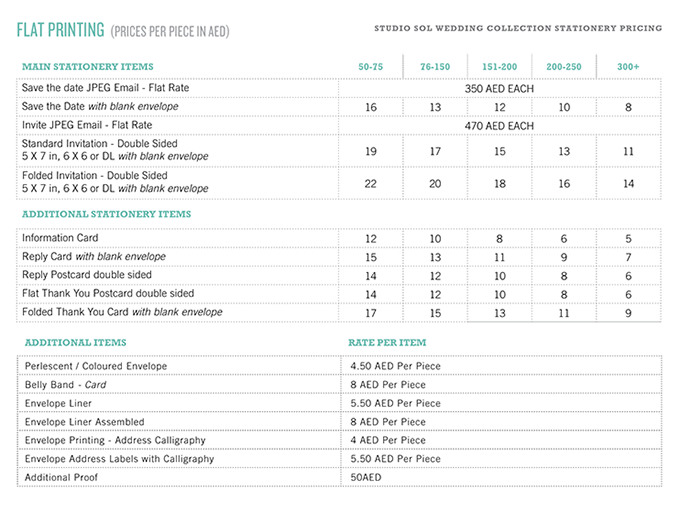 To give you a rough idea prices for a double sided invitation with envelope usually starts at about 25 AED each based on an order of 75. 8 page passports with envelope start at 35 AED each and luxury items such as silk folios and panels start at 55 AED each. Once we have established the style and quantity required I will send you through a quote. Should you wish to proceed, I will require a 50% deposit before I order any products or commence design. Using the consultation as our starting point I will design your invitation proof. This will include up to 3 design options using different fonts and layouts. After you have reviewed the digital proof and made any necessary revisions, final adjustments will be made and once I have received your sign-off, your invitations will go into production. It is your responsibility to proofread all pieces of your invitation suite very carefully. Up to 3 revisions are included. Additional changes may incur an additional fee. In most cases 4-6 weeks. I look to deliver your invitations 2 weeks after you approve the final proof. We require that you sign a copy of your final digital proof. We will not move forward until we receive your signed approval. It will take approximately 2-4 weeks to create your invitations, depending on the complexity of the design and the time of year. All deliveries will get delivered via courier or if in the Dubai area a personal drop off, to ensure safe delivery. Wedding invitations have a minimum purchase of 50. We recommend ordering additional envelopes for addressing errors (these must be ordered with your original order). If you wish, you may prepare your invitation wording in a text file and email it to me. Having trouble with the wording? We're here to help. Send us the facts and we will put it together - giving you a starting point, if you care to make changes. Additional items can be added to this collection such as rhinestone buttons, ribbons lace etc. Please let me know what you are after and I can customise your invite to suit your specific needs. 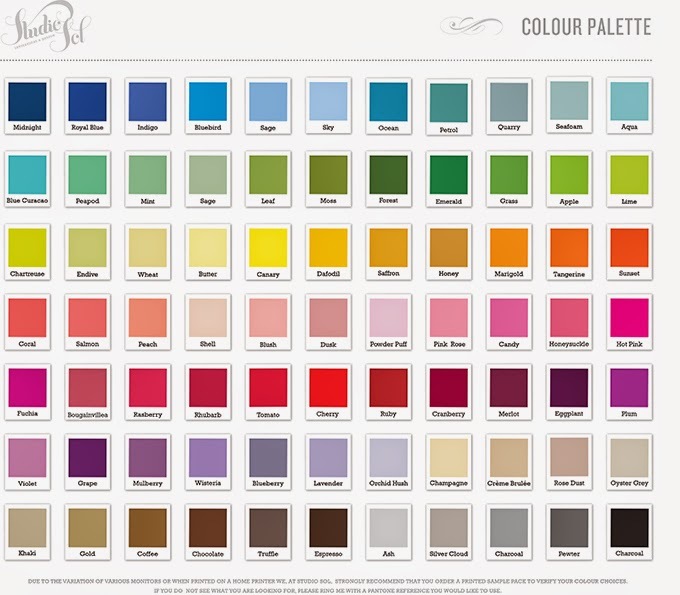 If you have a colour scheme in mind, please reference it from the colour palette when submitting your form. All items from the wedding collection can be customised with your own colour palette. Please bear in mind that colours vary slightly on screen to printed material.